1 1/2 story, 3x2 bay structure, sheathed in clapboards. Cornerboards. Concrete faced stone foundation. Wide overhang w/rafter ends showing. 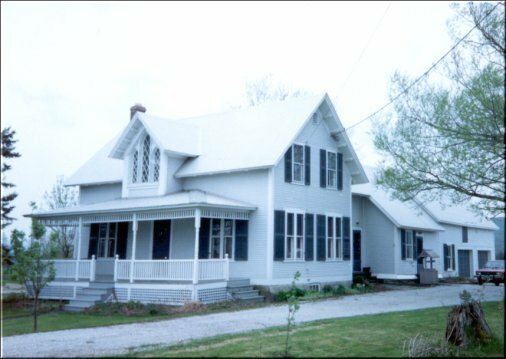 On front there is a hip-roofed porch with turned posts, spindle valance and railing. A large center oriel window rises from the porch roof. In its gable two smaller lancet windows flank a larger center lancet window w/diamond pattern muntins. The center entrance has a plain surround and a set of narrow 1/1 sash on each side w/louvered shutters. Gable end windows have shallow pitch lintel boards on the first floor and lip moldings on the second. There is an ell attached to the rear (southwest) that has two clapboard wing extensions. This attractive picturesque cottage was the residence of Rev. 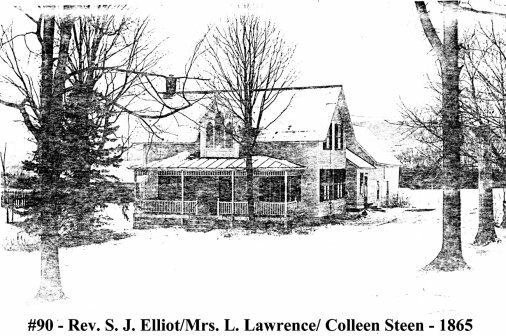 S. J. Elliot in 1857 and Mrs. L. Lawrence in 1871.